Redefine throughput and the customer experience in the busiest POS lanes. Zebra multi-plane bioptic imager can capture virtually any printed or mobile 1D or 2D barcode in practically any condition, with blazing speed. The modular design allows you to add a customer-side scanner for barcodes displayed on mobile phones, traditional loyalty cards or even impulse buys, as well as a handheld scanner and EAS, while providing expandability for future requirements – such as an RFID reader. The result? Higher throughput. Fewer abandoned sales. And a great lasting impression that will foster increased loyalty and return visits. Let us help you find the right Zebra scanners to meet the demands of your business. Contact your Zones account manager or call 800.408.9663 today. 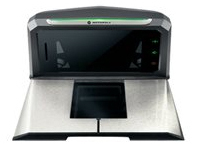 Get your high-volume POS lanes ready for the customers of today and tomorrow with the Zebra MP6000 multi-plane bioptic imager. The MP6000 enables your cashiers to capture virtually any 1D or 2D barcode in practically any condition with blazing speed – whether it is printed on a paper label or a plastic loyalty or gift card, or displayed on the screen of a mobile phone.